Sometimes, you will find that the best answer as a freelancer is “no.” It’s not always the easiest thing to say, but it is necessary at times. There are going to be days or projects that just don’t work for you. But how do you know when to say no? It can be a situational answer, and a project you turn down this week might be something you consider again in a year. What’s important is to find the balance in your schedule to take on projects that you feel good about, will derive a benefit from and can handle in the time allowed. The client wants you to work for free or much less than your normal rate. If a client has a reputation for being difficult or overly demanding. When the project is doomed, i.e. you know from the request that the client wants something that just won’t work or has no idea what they want. The project or client requires you to do something unethical or against your professional/personal code of ethics. So let’s break it down a little more into other types of projects that you can (and maybe should) turn down. And a few tips for doing it tactfully. Everyone has had one of those dud projects come along. You know the one – you dreaded working on it from the start. Chances are projects like this will not result in your best work, so why take them on? There are other projects that you get gut feelings about as well. Use your experience and intuition when taking on new work. Anything that asks for an impossible (or improbable solution). Projects that lower your hourly rate. It can be tough to estimate your time, but be careful so you don’t get caught working for $2 per hour. Anything that you would be embarrassed to add to your portfolio. Does the company have a poor reputation? Is the design concept absurdly poor? Does it conflict with your beliefs or morals? If you would not want your name on it, don’t take the project. Commonly, design projects have multiple components. For example, you might be asked to create a website design, business cards and fliers for an event promotion. But if any of those elements are outside your area of expertise, the project is not for you. Don’t take any project unless you are certain you can meet the deadline. Know what your work schedule looks like and turn down projects with timelines that make you nervous. If you have three clients with deadlines on the same day, that might not be possible to achieve. If the deadline is too short, talk to the client about the possibility of adding time to the project before taking it on. Not every client will be easy to work with. That’s perfectly normal. But clients that are overly demanding or don’t treat employees (or freelancers) well should be avoided. When you say no because of who a client is or their reputation, understand that they are unlikely to call again. Be wary of clients with bad reputations. How do they treat customers and vendors? Are they overly demanding? Do your research in advance. Anyone who has not paid you for previous work should be at the top of your “no” list. Clients who have not paid or are habitually late to pay should be avoided. Freelancing is a business too and invoices should be paid on time. If a client asks for something unethical or illegal say no. It’s that simple. Clients who want to pay based on proceeds or barter for services should also be avoided. This is often an indication of cash flow problems within the company. If the client keeps piling on tasks or things they want added to projects midway through at no cost, you can say no during the project. This is actually where a good contract comes in; it should state what work, revisions, add-ons, etc. are included in the project price and what you will charge for additional work. If a project deadline coincides with a planned trip, vacation or other time off, you should decline the work. Personal time is important too. Anytime a friend or family member asks you to take on a job, say no. Make it your standard policy. Mixing business with family or friends often turns out poorly: What if they don’t pay on time or like your work? It seldom ends well. Anytime a project includes content that you don’t believe in or agree with, you can turn a project down. This can be a little tricky, but it will be hard to do good work if they message is something you completely disagree with. Know yourself well enough to ask if you can separate client message from personal belief before you take a questionable project on. If you are incredibly busy, it’s fine to say no. Let a potential client know you are booked up and offer an alternative solution if they want to wait for you. How Do I Actually Say No? 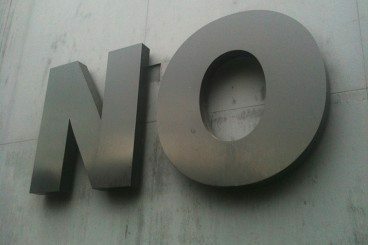 Now that you have some ideas of when to say no, how to you actually do it? The first step is to have procedures and ground rules that you follow. If a client asks for anything that negates your standard contract in any way, avoid it. Clients will talk about freelancers they have used, rates and how they work together. Stick to your policies to avoid getting into tricky situations down the line. When thinking about ground rules consider things like the amount you need to bring in per hour, what types of projects you do, payment terms and conditions, what types of clients you will work with and how many projects you can handle at once. Consider how you take requests for work. I only respond to inquiries for work in writing. There’s no confusion that way. I need everything via email before getting started and accept or decline every project in writing as well. You won’t get “tricked” into a project and can look over all the details in advance. Put together several “form” emails for how you will decline projects. Make sure the response is polite, sent in a reasonable manner of time and offer another solution if possible. Potential solutions could include your availability to do the project at a later time or different rate or offering the name of someone else who might be available to do the work. Finally, the best way to say no is to just say it. When declining work, don’t waffle or be ambiguous about it. Say no in a straightforward way. You don’t want to leave a client wondering if you are or are not going to do something. Every “yes” should come with a copy of your contract. “Nos” will not include that information. Saying no can be incredibly hard. No one wants to turn down work, right? But some projects can cost you more than they are worth in the long run in terms of time and reputation. Sometimes saying no from the start, is your best option. Most clients will understand and won’t strike you from their call list because you can’t take on a certain project. It is better to take on fewer projects and do a good job, than to do subpar work for more clients. Freelancing 101 is a monthly series to help the increasing number of freelancers in the market. Whether you are a designer, writer, developer or wear multiple hats, we will share tips, resources and ideas to help you make the most of your small business. Is there something in particular you want to know? How do you feel about this series? Let me know at [email protected]. Image Sources: sboneham, tuchodi, Horia Varlan, AranZazu, net_efekt and Henry Burrows.